This is a recent postcard I made for my personal collection. 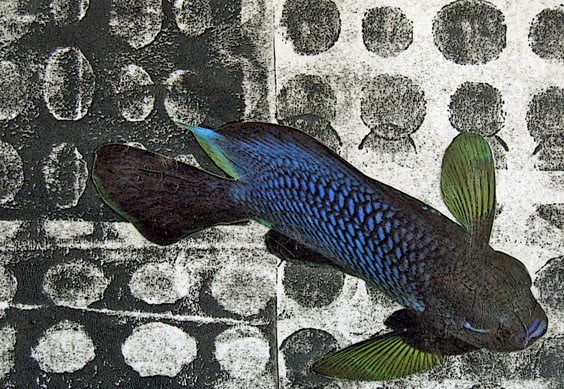 I don't think it's visible from the photo, but the fish is glossy on the matte background. These are two 8 x 10 inch paintings on stretched canvas, that I did this week. I'm going for grunge at the moment, facilitated in large part by the Lyra graphite crayons I've recently begun using. I'm liking them a lot. I have two that are water soluble and two that aren't, and to be honest I can't tell the difference. The non water-soluble ones actually seem to dissolve better than the ones that are meant to. Whatever. I've also used graphite pencil and Neocolor I wax crayons. 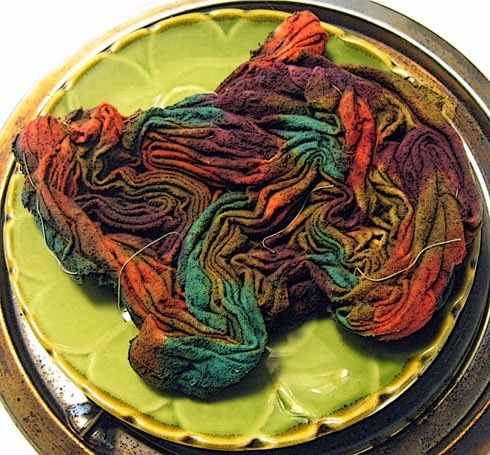 The Neocolor IIs are water soluble but the Neocolor Is are not. I love that elementary look you get with crayon and pencil. 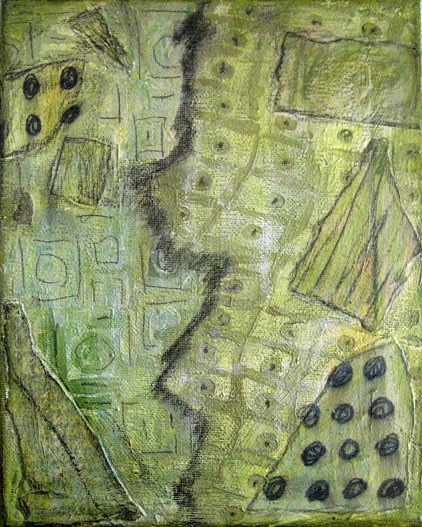 The greenish piece had a few collage elements adhered to the canvas before I began painting. The second piece began as a grungy background on which I decided to try a few other things. I dripped paint horizontally and vertically, with Golden High Flow acrylic paint (tiny samples provided by Golden), with Liquitex acrylic ink, and with Bombay India ink. I was testing different media to see which dripped best for my taste. Frankly, I liked the High Flow the least, it had quite a bit more viscosity than I imagined it would, thicker than ink. I'd definitely thin it with a bit of water the next time. At any rate, after letting the drips dry I painted over them, then enhanced the drip lines with graphite crayon and smeared that. In their original, simpler incarnations, I liked both of these pieces. But I decided I needed to push them further. My modus operandi is to want to be finished with things quickly. I've seen this mechanism at work in many areas of my life, not just art. It's about my being uncomfortable with uncertainty, with open-endedness, and with my seeking quick resolution and completion, and wanting to be done with something so I can say "I did it" and move on. It's also about not wanting to "ruin" things, and therefore not trusting myself to go farther. Just putting this situation into words is bringing up a lot of stuff for me. Anyhow, I've concluded that when I have the feeling that a painting is just fine and dandy the way it is, early on, that that's my clue to take a step back and then push the piece farther forward. I've also decided that it will be a far better strategy for me to work in series than on individual pieces. 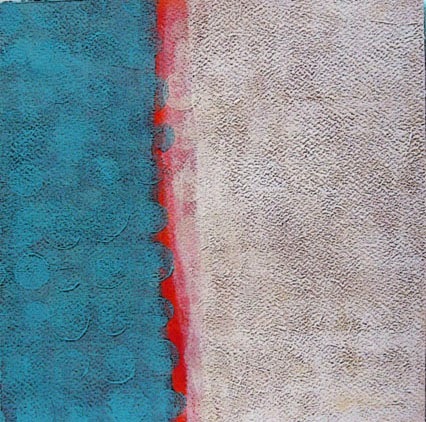 Two or more pieces using some of the same elements will flesh techniques out better than doing piecemeal work. Art Journal page, March 2014. Looks dimensional, doesn't it? While we're on the subject of not buying unnecessary art supplies, I thought I'd share this information with you. I've only recently (since early 2013) been using Golden paints and acrylic media. Before I began doing any "real" painting, they appeared to be way too expensive for my budget. But eventually I invested in Golden's Fluid Acrylics, and I'm so glad I did. They're so loaded with pigment that they really go a long way and I believe their qualities are unmatched. Also, over the last year I've been trying a lot of different gels and mediums and learning their properties and how to use them. If you've price-shopped acrylic paint, Golden looks pricey...but only if you're comparing them to Liquitex or Blick's house brand. Most of the other brands of acrylics are quite a bit more expensive than Golden. Yet I'm quite sure Golden is the best. No, this isn't an advertisement for Golden Paints, just a missive to let you know how impressed I am with the company, primarily for what follows. It took me years to invest in Golden Fluid Acrylics while most artists began using them years ago. I was still working on fabric back then, still working with dyes, yet many of my textile art pals were buying large quantities of the Fluid Acrylics and thinning them with Golden's Acrylic Flow Release, which breaks the surface tension of the paint and allows it to be used more like dye...more, actually, like Jacquard's Dyn-a-Flo acrylic paint. I just couldn't go there, couldn't see myself using expensive paint on fabric. Fast forward to maybe last year, and I've just invested rather heavily in Golden Fluid Acrylics, and Golden changes the name of their airbrush colors and begins marketing them as Hi-Flow Acrylics. Many of the painters I'm now following are using the Hi-Flow paints extensively because the consistency is almost like ink. But I'm not about to buy an entire new line of Golden paints when I've only just begun to use the Fluid Acrylics. YES, you can use Flow Release with Fluid Acrylics for a higher flowing paint, but a better solution to having to buy a new line of paint would be to use Golden's Airbrush Transparent Extender with the Fluid Acrylics. This would work fine for the small amount of use I anticipate for ink-like paint in my work. He cautioned, "Just don't expect to cover large areas of a canvas or paper with a layer of paint that is absolutely consistent in color across that area." Which isn't something I would do anyway. So I'm passing this information on and if you can use it, good. Golden Paints is extremely forthcoming with tech support about their products, color and mixing charts, and samples. Helpful in every way, and gracious about your investing in their products. I painted this 12 x 12 inch piece (on canvas panel) on Saturday, along with one other. Two paintings in one session is new for me. 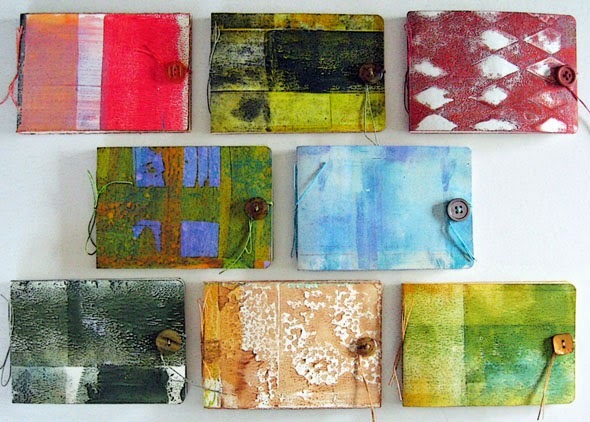 I'm working again, for now, with Wabi-Sabi Art Workshop by Serena Barton. I love this book, although it calls for a lot of art materials that I don't have and don't feel inclined to purchase. 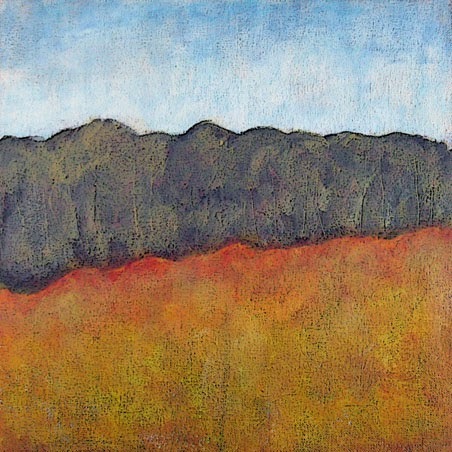 For instance, in the section on abstract landscapes from which I was inspired to paint this piece, the author uses Adirondack re-inkers with acrylic glaze medium to create thin glazes of color. I'm using fluid acrylics instead of re-inkers to create my color glazes. It feels a lot more in keeping with the wabi-sabi concept (things old, worn, well used, recycled, imperfect, etc.) to use what I already have, as much and as often as possible, than to buy yet more art supplies. 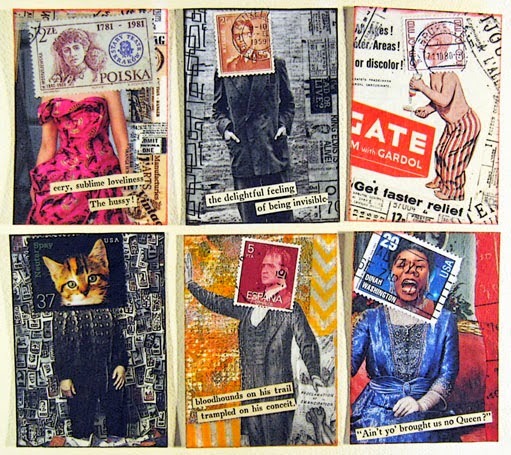 Three of my recent collage postcards. The Fortuna Library had it's semi-annual sale a couple Saturdays ago. I picked up a few new books for my collection. 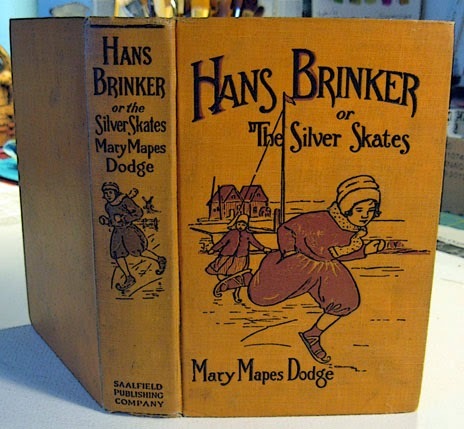 This is a near-pristine edition of Hans Brinker. No publication date inside and there appear to be a ton of first editions on Google and eBay. All I know is that the book was originally published in 1865. This was my splurge for the day, at a mere $2. 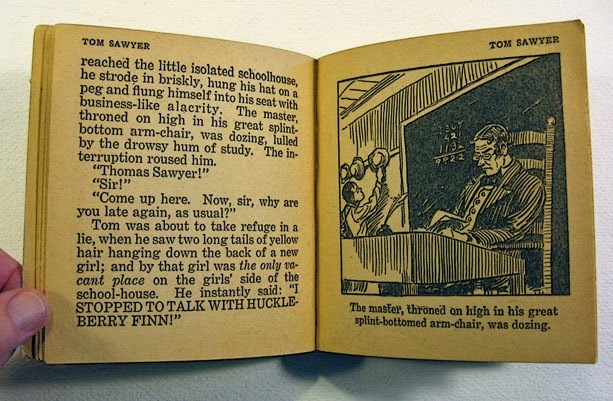 Now that I see the enormous sums that some of these old kids books are fetching at eBay, next sale I might pick up a lot more of them and list them for sale. I was one of the very first people to enter the sale and headed right for the "really old book" area where Hans was. There was a rather large collection of other really great old kids books but I refrained from buying any others because of my space considerations. Soon as I went around that tiny area and came back to the kids books, all the others were GONE!! Someone else will be making a mint reselling them. 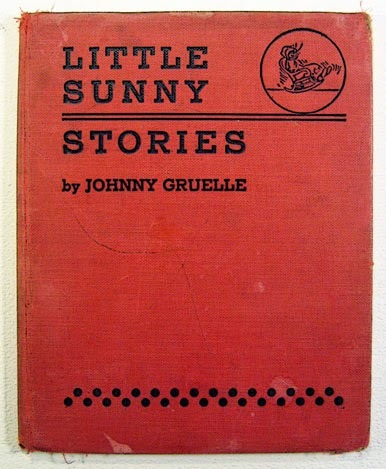 Little Sunny Stories was a 50-cent buy. The author's name is familiar to me...just Googled him and, oh yeah, he wrote the Raggedy Ann books and others. What's most interesting to me is how an author's name, from nearly 60 years ago, rang a bell in my brain. This one also doesn't have a date of publication, although the inscription, "To my Little Emerald, Mama" is from 1940. 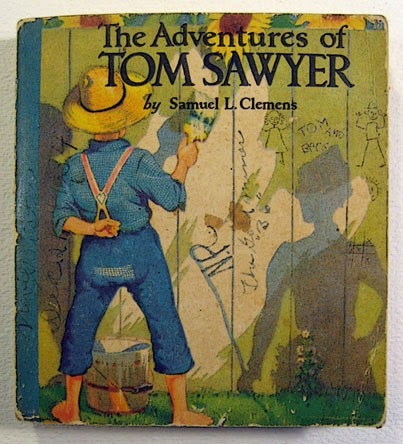 This graphic-novel style version of Tom Sawyer is from 1934. This was another 50-cent purchase. 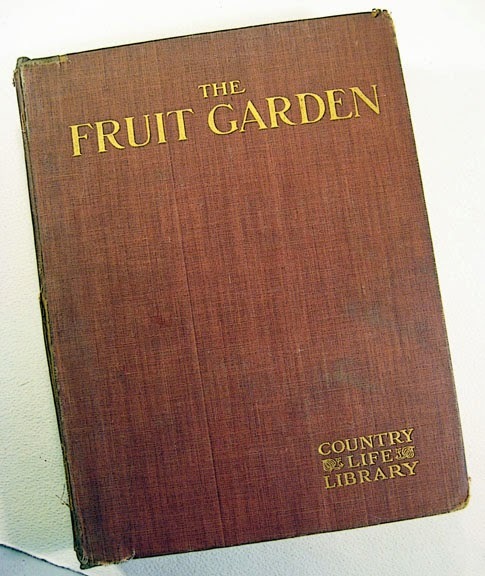 This garden tome is from 1904. 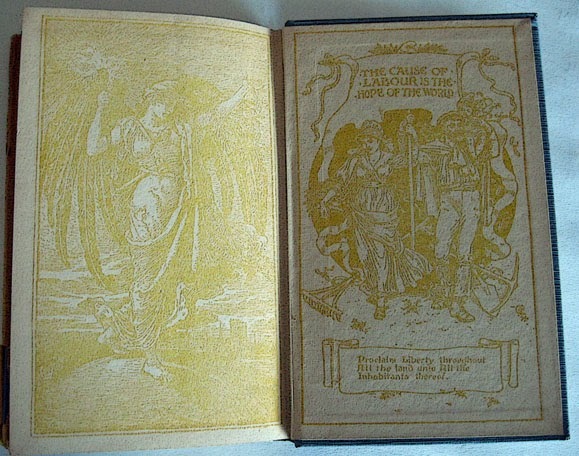 The cover isn't in the greatest condition, but the book itself is completely sound and it only cost me $1. This edition of Romola by George Eliot is apparently from the late 1880s. The first few pages are torn out but I just Googled it to get publication date. 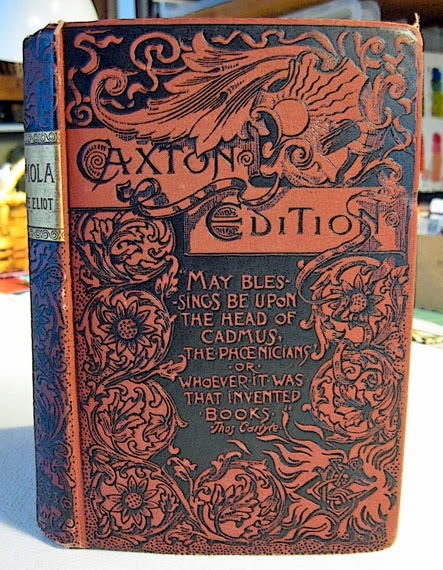 Looks like there was originally a full set of Eliot's works like this. At any rate, the cover is what knocks me out. It's engraved or embossed. I actually bought this just for the cover, and the 50-cent price. Yesterday I posted a new batch of Button Booklets in my Online Shop. Click the link to go to the post with all the details. There were 16 available (only 8 shown here) but a few have sold already. When you purchase, be sure to indicate your 1st, 2nd and 3rd choices in the Instructions to Merchant section of the PayPal invoice. Made another batch of Stampheads on Saturday. 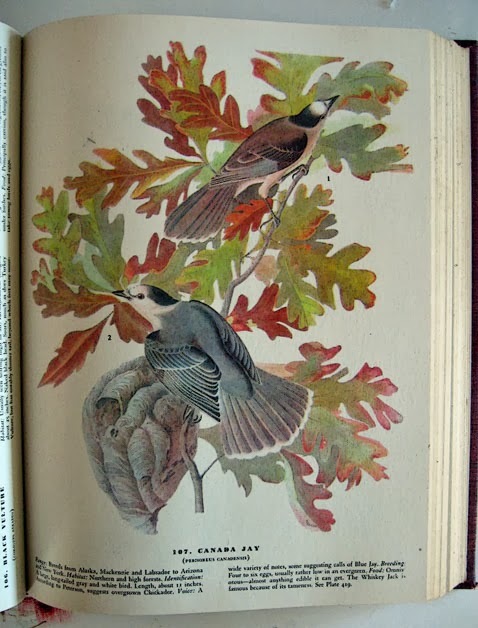 Some of the background images are from vintage magazines, and some from contemporary mags. 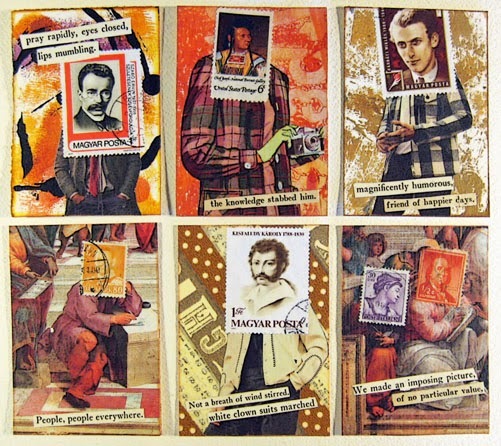 I also did a new series of collage postcards over the weekend. So now I have a lot of stuff to post...and I might post more regularly this week than intimated last Friday. But at least I don't feel as though I have to. And I know you'll all be here regardless. Interesting that by removing that sense of being compelled, I am being as (or more) creative than before. Earlier this week I had the startling realization that I've been subtly stressing myself out by feeling the need to blog six, or lately seven days a week. This has been going on for well over a year, and possibly two or three years. The need originally began as a want, but I know it was really motivated by some internal competitive mechanism within me that has morphed over the years, but still alive and well nonetheless. All that to say, I'll be posting less often here. Which means I don't have to keep myself on a virtual treadmill of creating in order to have stuff to post. I've also cut way back on Facebook, for largely the same reasons as above. I've shifted into this phase, and perhaps it's just one of the many blessings of aging, where I don't need the acknowledgement or the approval to just live my life and be who I am. This is a good thing indeed. This is a piece of raw silk that I pleated and stitched two years ago. I dyed it this Monday. The fabric measures 15 x 34 inches. I used the finger pleat method, gathering up folds of fabric with my fingers then using a running stitch and a very long needle to hold each group of pleats in place. To the left is the pleated fabric after it was soaked for a couple days to wet it out; on the right after steaming and drying out a bit, just before I took out the stitches. I did in fact list those collages yesterday on my Sales Blog. Click on any photo in the post to enlarge them all. There's a sample pack shown for each color group. There's one payment button for each of the two available sizes. Make your color selection for the large collages (11x14") then click Add to Cart, which will open in a separate window. Return to the blog window to select another color and/or to purchase one or more small (8-1/2x11") packs. 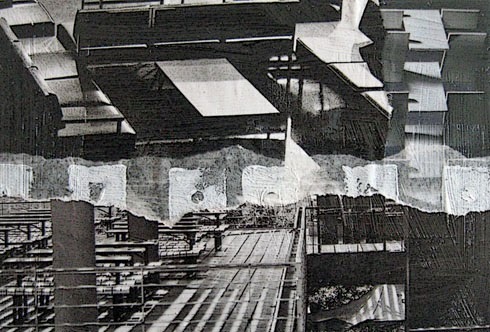 My collage practice/operation has changed a lot over the years since I began it in 2008. 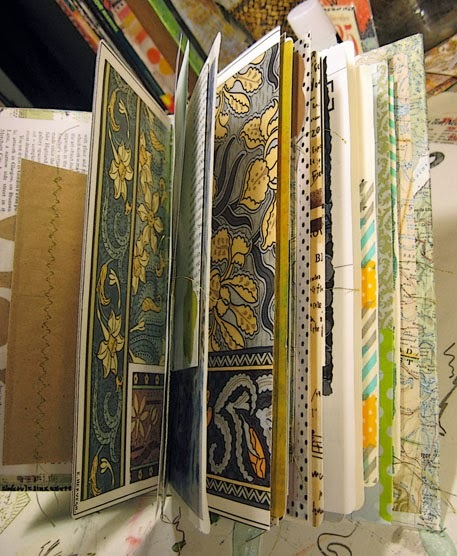 I've had an entire shelf devoted to sketchbooks filled with collaged pages, in both 11" x 14" and 8-1/2" x 11" sizes. 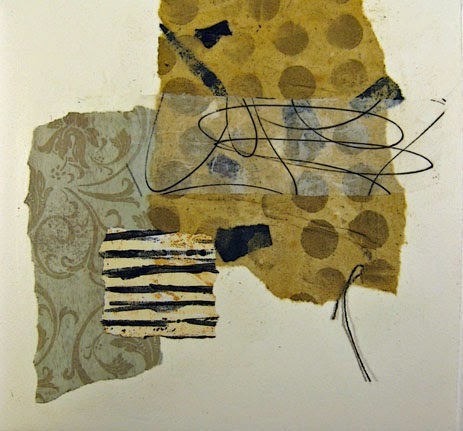 The older collages have been on the block in the back of mind as things to be gone through and culled. I did just that this weekend. 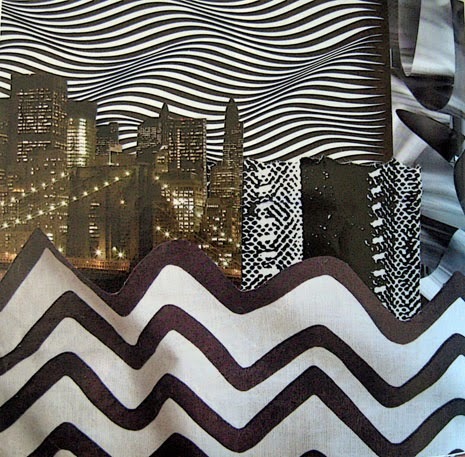 Every one of these collages has been digitized ~ I did that month by month as I created them and posted them on their own blog for the first three years. But I have decided to let go of about half of my collection. 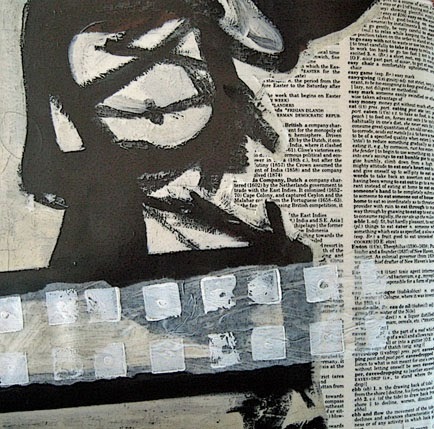 Those would be the original magazine photos collaged onto 60# drawing paper sketchbook pages using rubber cement. A few have had paint applied over the photos. 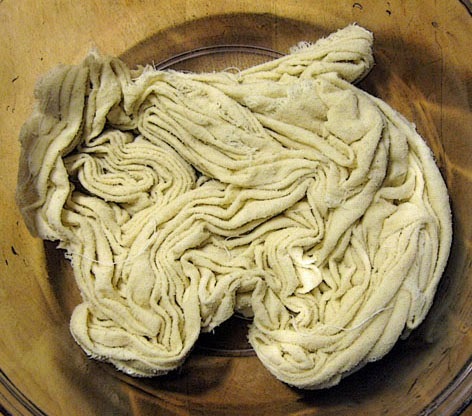 Some include handmade paper bits. Before I post them for sale on my Sales Blog, I'd like to get a reading of potential interest from you guys. 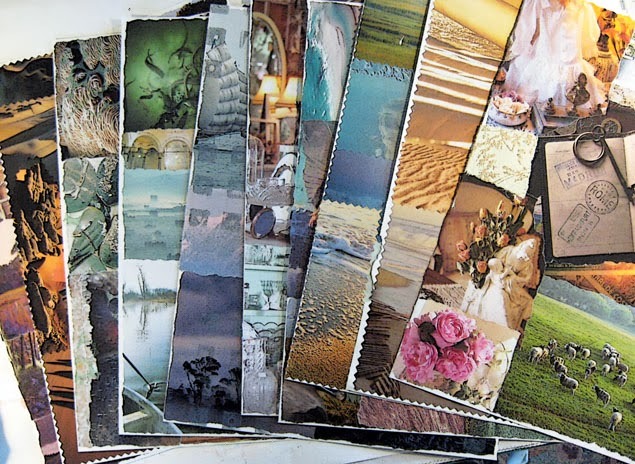 I've bundled the collages in packets of 10 pages each, in 8 rough color groupings, to sell for $20 plus shipping. That's ten 11" x 14" collages per packet. Additionally I have 5 packets of 8-1/2" x 11" collages in a Misc. 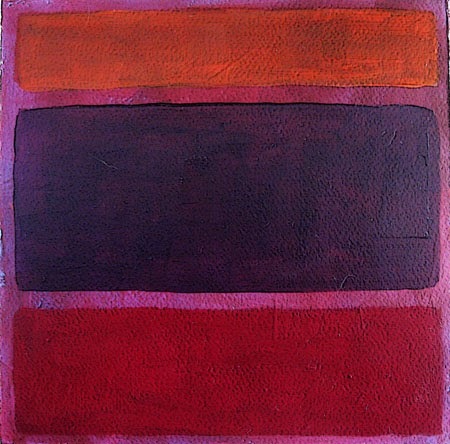 Color group. The smaller packets will sell for $15 for ten collages, plus shipping. International shipping is rather pricey, however, that option will be available for those who want it. 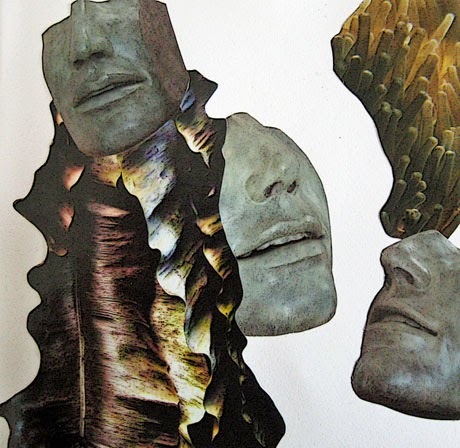 So, what can you do with these collages? 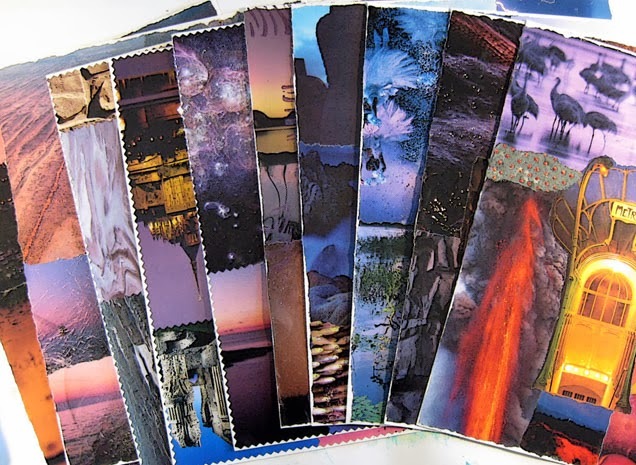 cut them up into smaller bits and use as starts for ATCs, postcards, etc. 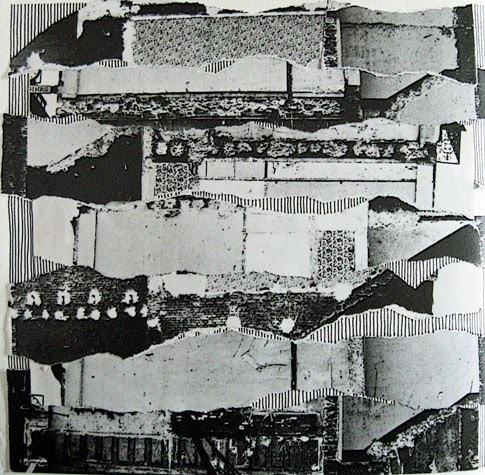 but with this caveat ~ the collages are not copyrighted because they rely heavily on others' photographs. Use them in your own work or possibly use parts of them in individual works to sell. But please do not turn around and put these out as your own work, unless you intend to deal with the copyright issues involved. You're likely asking yourself why I don't do those things with them. Well, I still have more collages left than I am letting go of, more than I can use in my lifetime. So I want to get some of these out into the world and let other artists have at them. 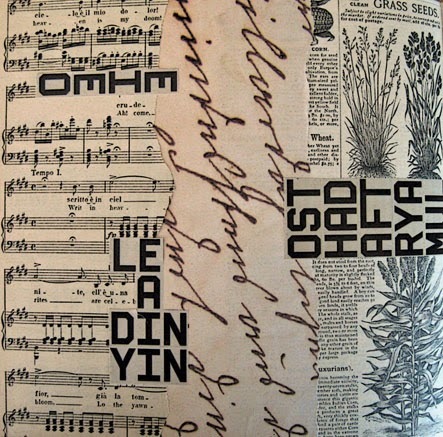 And I don't want to go through all the bother of trying to sell digital image collage sheets, even though I've already got digital images (although I might revisit that idea for some of the collages I'm keeping.) And I really do want to move some physical stuff out of my studio. So... Please leave a comment on this post and let me know if you would be interested in having the opportunity to buy some of these original collages. Indicating your interest IS NOT a commitment to buy. You're just helping me decide whether to go ahead with listing them for sale, creating PayPal buttons, etc. Thanks so much! 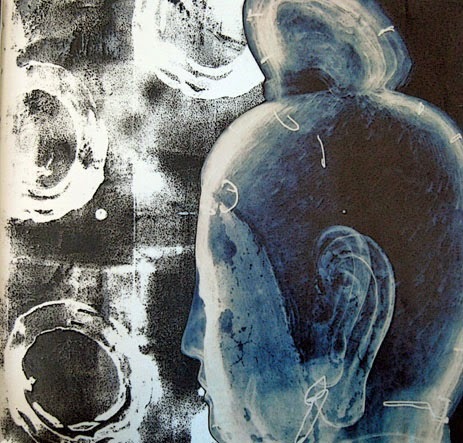 Today's featured artist is Jacki Long. 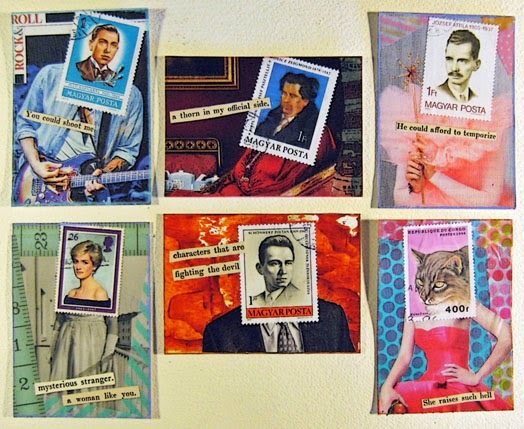 I met Jacki via Facebook not long ago, and we've been trading mail art since. No one wields a glue stick with as much flourish as Jacki. What she does with cool papers and junk mail continues to astound me. Always different, always beautiful, always thought-provoking. 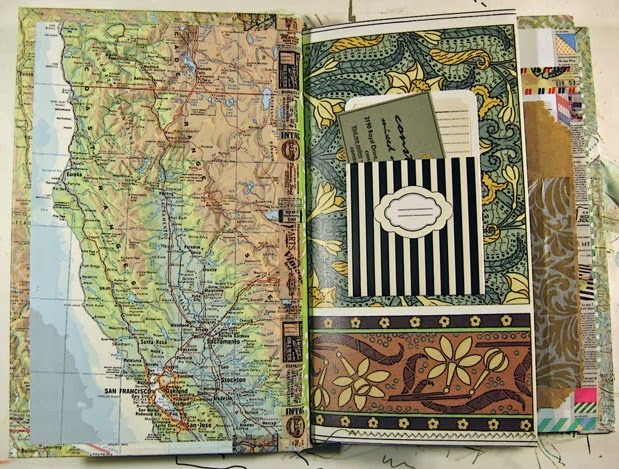 Jacki teaches journaling and collage in sunny Southern California. Some of her gorgeous photos of the SoCal coast almost make me want to live down there again. Jacki is also a long-time student of martial arts. Check out her great work! I painted this 9 x 9 inch piece yesterday, on the orange background I prepped at least a month ago. Is there a name for a vertical landscape, besides vertical landscape? I can't decide which orientation I prefer, vertical or horizontal. Either way, that orange center really grabs the attention. 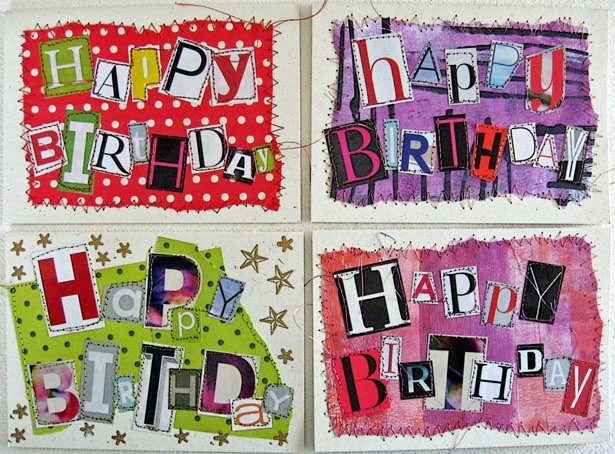 After I completed that first set of birthday cards, I moved on to these. 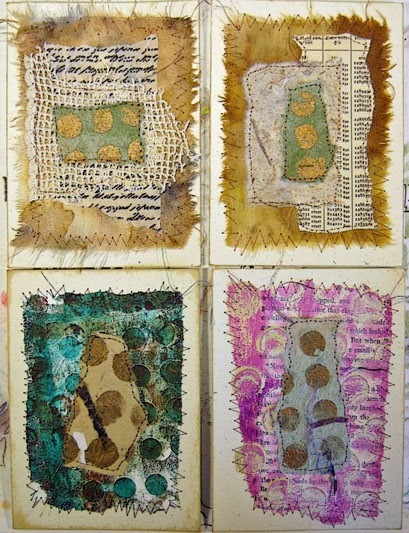 These are paper and fabric scraps, and lace in a couple cases, stitched onto blank notecards. The first set of birthday cards were a lot of fun. These were also fun plus a lot more representative of my preferred wabi sabi style. The blank notecards I've been using are part of what's left from a huge stash I bought in the early 1990s, when I made and sold notecards. It's beautiful recycled cardstock with wheat-like fibers from a company in New Mexico that's no longer in existence. I originally had boxes of 500 cards and envelopes in six or seven different natural shades. I used a lot of it, sold a few boxes, and now have just these natural off-white cards/envelopes left. And still more than I'll likely use during the rest of my life. And speaking of things no longer being available, the cardstock I've been using for close to 25 years for my business cards is no longer available. Fortunately I still have close to 30 sheets left, and since something is nearly always changing on the card, I only print two or three sheets (20 or 30 cards) at a time these days. I had to stop myself from working on that list of other things exclusively, and get back to painting. The list kept getting longer, and painting was receding farther down in priority and into the past. Decided to begin this after-class exploration with color fields, largely because I have a bunch of backgrounds already painted from when we were on this lesson in Extreme Composition. I'll do a number of paintings in this genre until I'm ready to move onto something else. 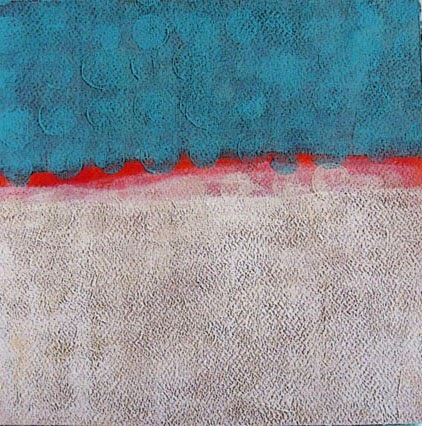 This piece is 9 x 9 inches. 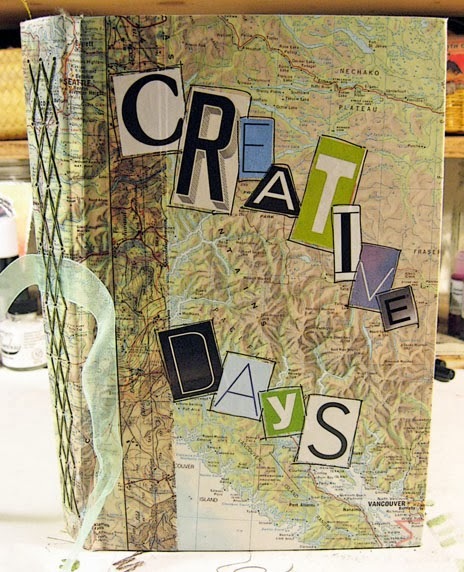 Later this week I'll be moving my "everyday journaling" into this new journal, Creative Days. I made this last August in the class I taught for NorBAG in Arcata. And I've since titled it and kitted it out to make ready for use. I've decided not to put dates or annual seasons on the covers of these journals, since they always take me longer to fill than anticipated. 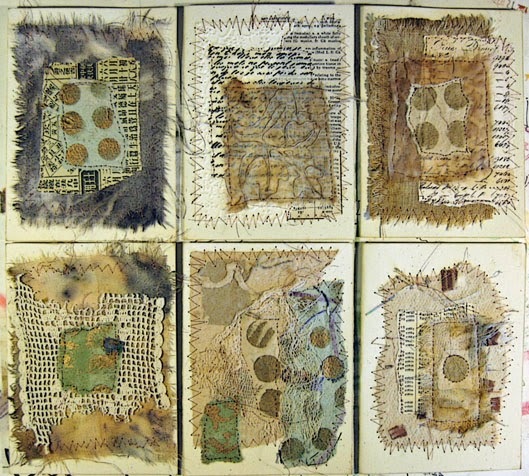 You could say this is the current incarnation of my shabby journal series, begun in Mary Ann Moss's Remains of the Day. I still keep a regular writing journal, and have since...I can't remember, actually. I know I began the enterprise when I was in high school, then took a break before picking up the operation again over 30 years ago. 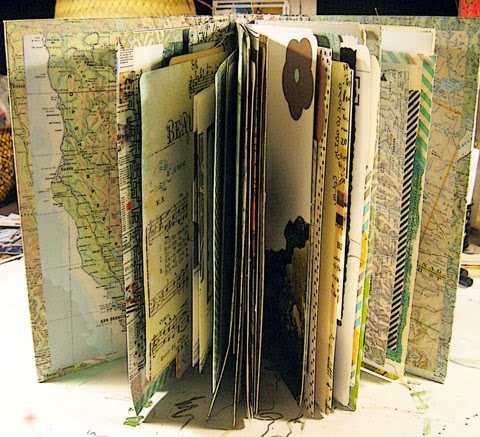 I've been pondering how to bring my shabby or junk journal and regular writing journal together. And I have an idea that's in development. My plan is to create the hybrid journal and be ready to move into it when Creative Days comes to an end...which should be when I run out of pages in the current writing journal. Late this year is what I'm anticipating. I needed some birthday cards to send to friends. Was in a sewing mood the other day. So I made these. 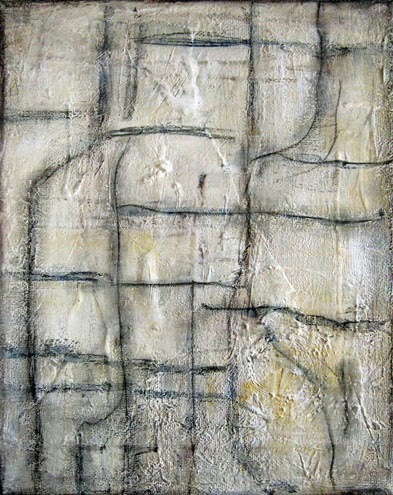 Paper machine stitched on blank notecards. 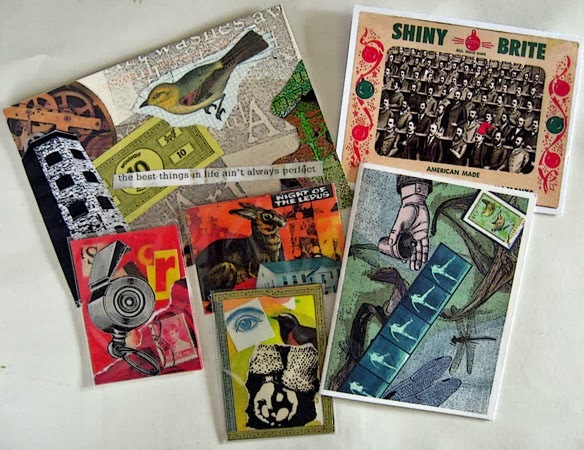 Today I'm featuring the work of Terry Garrett at Whisperwood Art Works, another member of my Dream Team of collage, journal, and mail artists. 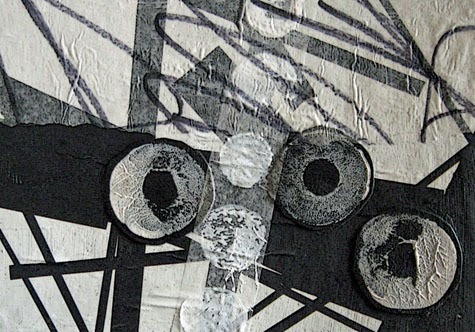 Terry's mail art is superlative, his digital professionalism easily proving that he was for many years an art teacher, a book arts instructor to boot. 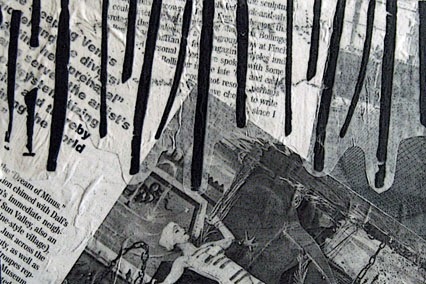 Terry's art journaling is some of the best I've seen. He really uses that medium to delve deeply into his own soul, and produces amazing works of art in the process. Check out Terry's awesome art! 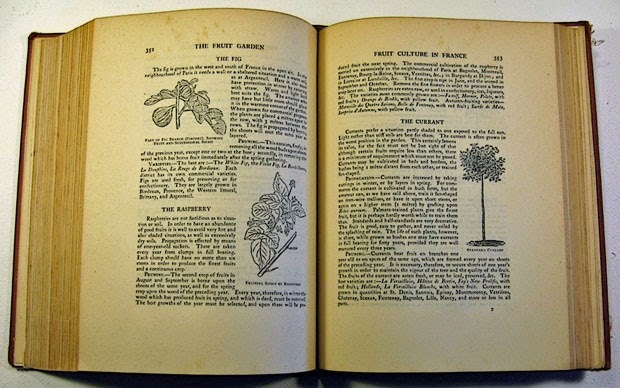 I forgot to show you this book when I previously posted images of the old gardening/natural history books in my collection. 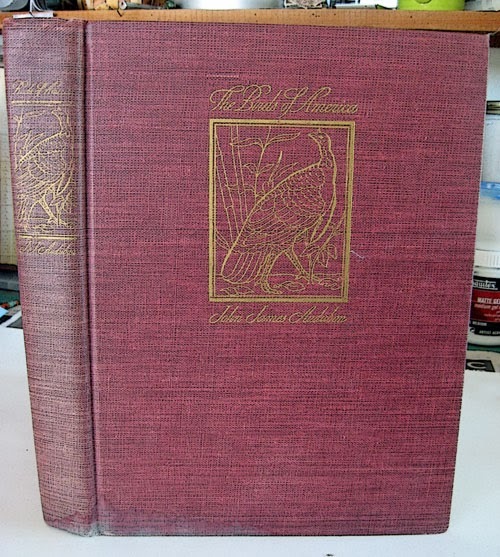 This one is The Birds of America by John James Audubon, from 1946. 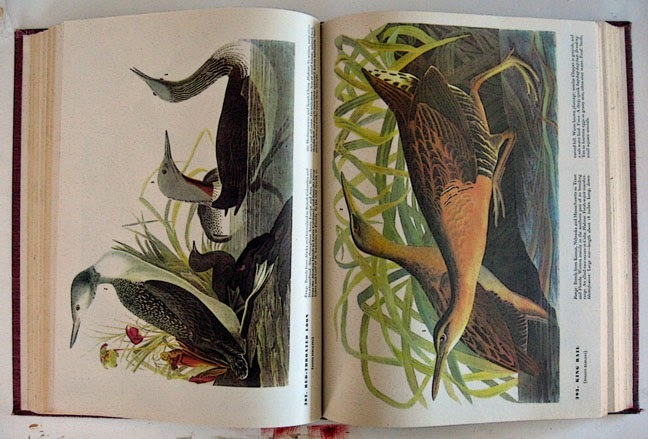 Large format, every single page has gorgeous color plates on wonderful old paper. I got this for $.50 at a local thrift shop, thinking I might cut it up for collage fodder. But I just can't! 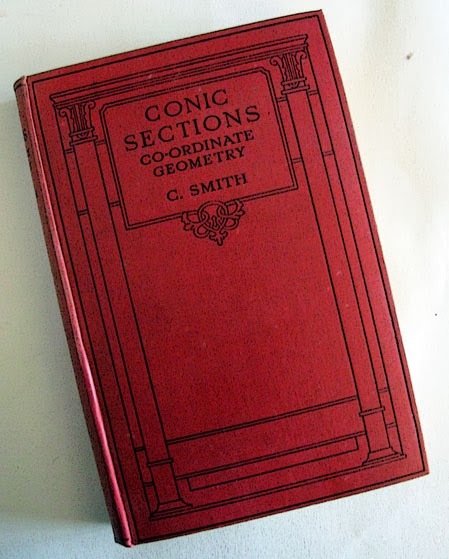 Another unusual math-related book from the Bargain Shelf at Eureka Books. This one is from 1924 and has hand written annotations, sometimes full pages, glued in (see next photo). 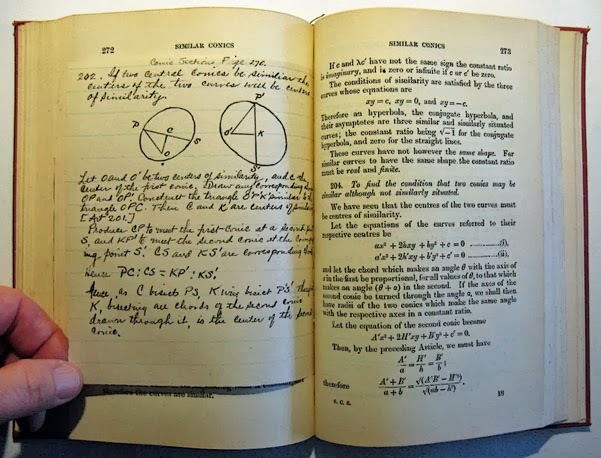 Love these old math books. Here's an odd one, from 1905. Could have been written in 2005. 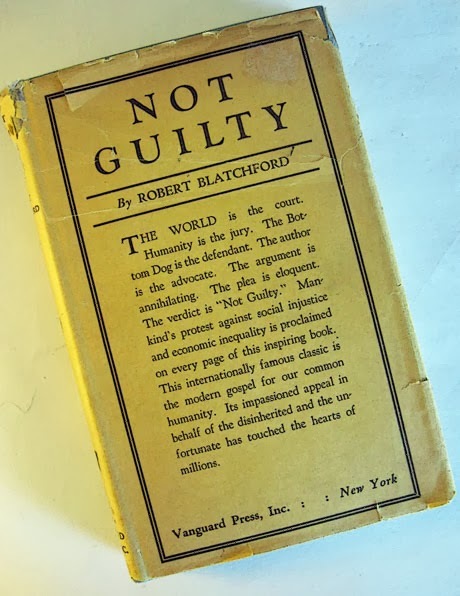 NOT GUILTY ~ A Defense of the Bottom Dog. Read the cover. These are the end papers, front and back. Simply beautiful. (c) constancerosedesigns 2008- 2016. Simple theme. Powered by Blogger.